Description: This is a hand-held, battery-operated player that plays small records that are laminated on the pages of Talk-To-Me books. A phonograph needle spins inside the player while the player sits on the record on the book, then out pours noises and voices of the characters on the pages. This player plays any of the the 26 Talk-To-Me books that were sold separately. 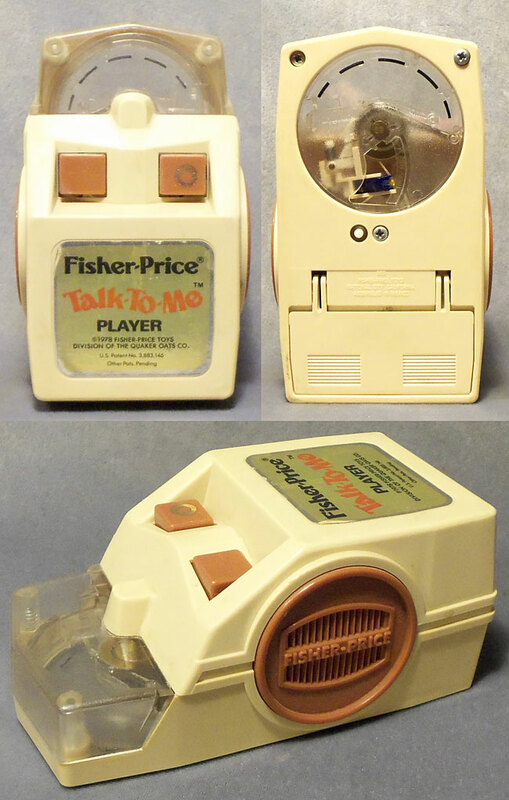 FPT10780 - Small tan plastic Talk-To-Me player with a clear bottom window and brown toggle switch. Has a paper lithograph on the top marked "Fisher-Price" Talk To Me Player. Measures 5-1/4" long, 2-1/2" tall. FPT10780-COVER - Small tan plastic battery cover for the FPT10780 Talk-To-Me Player (should NOT be removable, but often found broken off). Repair: If your Talk-To-Me player plays slow (or not at all! ), you may want to check out our REPAIR STATION. We can restore most Fisher-Price Talk-To-Me mechanisms to almost new condition! This player requires 2 "C" cell batteries. Uses phonograph needle #BO 0824 (this is the Fisher-Price part number, but they no longer stock this part). Replacement needles and other maintenance/repair items for this phonograph are available at This Old Toy's Toy Store.